It’s Christmas Eve Eve!! 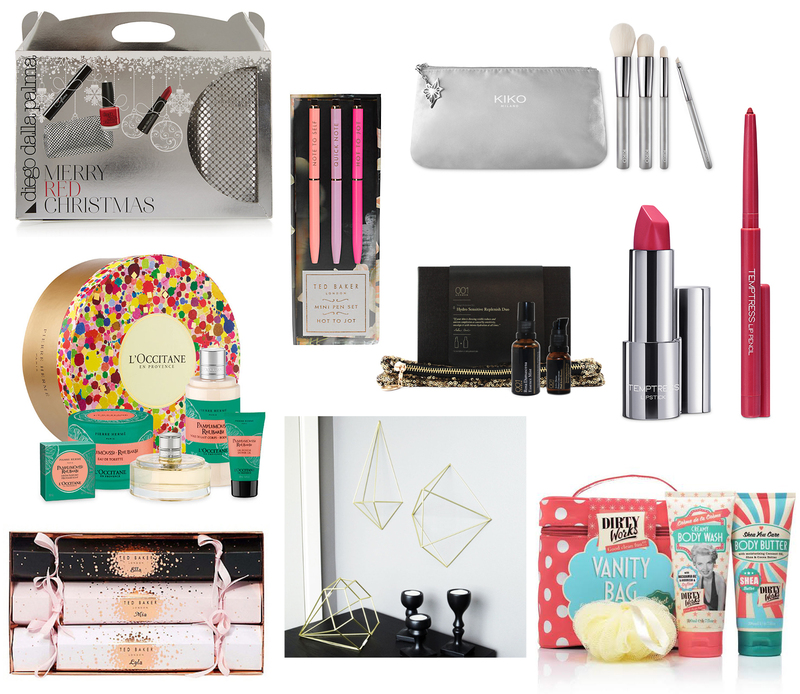 I’m so excited 😀 This afternoon is reserved for tidying and cleaning the house, eating mince pies and wrapping presents… so to put off doing the cleaning, I thought I’d put together a few last minute gift ideas for you – enjoy! Diego Dalla Palma Merry Red Christmas Gift Set – This gorgeous gift set is perfect for beauty lovers this Christmas, it contains a signature red lipstick and nail polish, with a deep black lashes booster mascara and glitter silver clutch bag – it’s also now half price at M&S! Diry Works Vanity Bag – Dirty Works have some fabulous affordable gifts available for Christmas, and this Vanity Bag is just the right size for keeping all your beauty essentials together. It’s only £6.50 from Sainsburys and also contains a Body Wash and Body Butter too! Kiko Cosmic Starlets Brush Set – You know how much I love Kiko products! This gorgeous Cosmic Starlets Brush Set contains four professional brushes: a Face powder brush for applying and blending powder products, a Foundation brush for applying liquid and compact foundation, a Conical eye brush for applying concealers, cream eye shadows and highlighting bases, and an Eyeliner brush for easily outlining the eyes and creating graphic make-up. Presented in a satin bag embellished with a star charm this set is ideal to give as a present (or to keep for yourself). Kiko Cosmetics Temptress Lip Set – More Kiko! They have some gorgeous gift sets available for Christmas, and this Temptress Lip Set comes in four different shades, to suit fans of nudes, reds or pinks. The set contains a lipstick and lip pencil that comes in a stylish packaging in line with their Cosmic Starlets collection. 001 Skincare Hydro-Sensitive Replenish Duo – I’ve recently been trying this 001 Skincare set which sounded spot on for my skin type. This is one of three targeted mini sets that would make fantastic Christmas gifts for those looking to try out new skincare products that really work. Each set contains 001’s best-selling multitaskers expertly blended to regenerate cells, hydrate and boost radiance. The Hydro-Sensitive Replenish Duo includes a Rosa Damascena Essence Mist (30ml) and and Active Marine Power Concentrate (15ml) which are perfect for sensitive and dehydrated skin types. All three kits also come presented in a sparkling gold sequined clutch within a Black 001 London luxury gift box. L’Occitane Pamplemousse Rhubarbe Tantalising Collection – One of my favourite skincare brands, L’occitane have a fantastic amount of beautiful gift sets on offer this season, and the Pamplemousse Rhubarbe Tantalising Collection is just stunning. The signature L’Occitane gift box contains a beautiful collection of products made with a grapefruit essence, blending crisp, green top notes with a sensual heart and a woody base of cedar and vetiver. This is the perfect luxury gift! Ted Baker Mini Pen Set and Christmas Crackers – Ted Baker make some of the best gifts ever, and if you know a stationery lover, I’m sure they’d appreciate this sweet little pen set! Or maybe some luxury Christmas crackers? Each of these crackers contains a different mini 10ml TB fragrance and a nail polish.